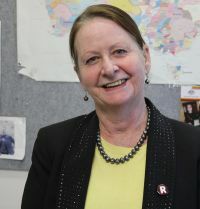 Maggie Walter (PhD), a descendant of the trawlwoolway Aboriginal people of North Eastern Tasmania, is a Professor of Sociology in the School of Social Sciences at the University of Tasmania, Australia, where she teaches and researches in the areas of social research methods, family, Indigeneity and race relations. Her books include the best selling Australian text; Social Research Methods (Ed. 2006:2010:2013) and Indigenous Statistics: A Quantitative Research Methodology (2013) (co-authored with C. Andersen 2008). Maggie's socio-legal related research includes a study gauging the effectiveness of juries in combating public misconceptions of crime rates and a study of workers' compensations claimants interaction with workplace injury legislation. She is currently engaged in a research project investigating Australian Aboriginal people's perceptions of non-Indigenous values, attitudes and institutions, including legal systems.